The plan was　to trek the entire way from Murodo to Kamikochi, the classic North Japan Alps traverse, but many elements made us change our mind. With typhoon and earth quake happened just before we started our walk, we had not idea what the 6 day routes will be like. Also the snow patches have been very resilient this year, due to short of rainfall. The trek may not be too enjoyable for Martina. Maybe a project for future years. So our hiking trip became a two parts affairs, we did a one day walk in Murodo a plateau at over 2o00m attitude then transported to picturistic Kamikochi to climb the highest mountain on our original route, Hotakadake at 3190m. To do that Martina had to walk up an one hour long snow field to get to a beautiful mountain hut in the Karasawa valley. Complain of the harshness of the condition as she may, she did find the valley to be incrediblly beautiful, with towering peaks cradling three sides of the snowfield. The hut, Karasawa Hutte sits right in the middle. The next day, I went up the peak on my own, over an interesting rock scramble to another mountain hut that sits at a saddle point on a ridgeline. Climbing up ladders and chains, I finally got to the top. On a good day, I will be able to see every single peaks from Tatayama to Hotakadake, the journey that we planned to have taken. But the cloud rising from the valley, I have to be content with the sea of cloud beneath my feet. Hiking in Japan is an enjoyable experience, the mountains are beautiful of course, but the huts located at the remote mountain top and alpine meadows provided us with comfort and good food is what impressed me the most. Got to come back some other time. Just finished the hiking part of our Japan trip. 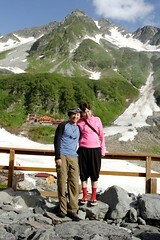 Climbed Hotakadake (3190m） the third highest in Japan. Gonna write a bit more when I got back to Tokyo. I've been ramping up my cycling mileage this week. On last Monday, I cycled 68km in Tung Chung, followed with a 6km run in the midday heat! The cycling was mostly flat, with a long time looping around the under-utilised road of the Disney Hotel. Then on Saturday, another long distance training in Shek O, I cycled 45km, looping Shek O Road 5 times. Then ran the hilling road between Shek O and Big Water Bay 3 times (12km). Hence I felt Sunday was well earned rest day. My bike muscle endurance is still pretty poor, take the Shek O session for instance, I managed a speed of 27.3 km/h on the first loop, but by the 5th loop and cadence of 89rpm. But by the firth loop I am doing more like 25km/h and 80rpm, yet my HR has reduced at the same time, meaning I simply coundn't work those muscle hard for too long. Just want to advertise the launch of the wedding blog for Martina and I - The Freeoursouls Wedding. What? What Wedding? In case you didn't know, check out the details.